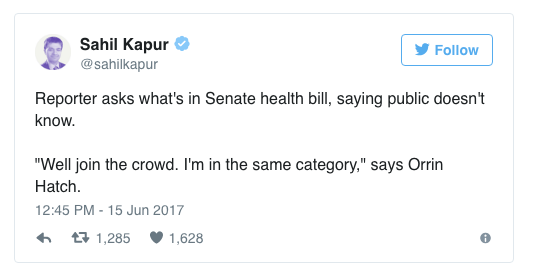 Why are Senate Republicans hiding their health care bill? OK, let’s set aside the partisanship to objectively consider that question. significantly change the insurance many of the rest of us have. Many Republican Senators have yet to see the bill. HHS Secretary Tom Price has not seen the bill. The President has not seen the bill. The Wall Street Journal is upset with the process. The Conservative Review reports Orrin Hatch (UT), the second-highest ranking Republican Senator hasn’t seen the bill. avoids an accurate assessment by the Congressional Budget Office. My son had chest pain and went to the ER on a Wednesday night around midnight. The ER was packed. He got priority due to the chest pain which was diagnosed as pneumonia. When done, he asked the Doc if this was a high volume night. The Doc said, “No. It’s like this every night. 90% of the people here have routine issues and shouldn’t be in the ER, so the system is broken.” I don’t know what the new system will look like, but the status quo is insane. I haven’t seen my own doc in over a year. Visits are too expensive. Not long ago I used to pay $10 for wellness visits. There’s no more preventative care which means people have to be very ill before they’ll visit the doctor. Not sure what the new plan will look like, but it can’t be any worse than the system we have today. My advice: eat healthy, excerise, have a good prayer life. I am still healthy at 80 but realize that anything could happen. My former boss, the president of a think tank in La Jolla, CA, author of many books, was healthy too and had a sudden stroke at age 86. He cannot even sign his own name now. Luckily he could afford to live in a seaside managed health-care facility. But I, on Social Security, live with my daughter and son-in-law, whose income is less than $40K a year. and who also depend on half of my Social Security check. Should I somehow deteriorate mentally, and the GOP’s new AHCA bill is passed, I and hundreds of thousands like me are doomed. I am on Medi-Cal (California’s name for Medicaid). So many of us will have no choice but to find a way to die jn dignity. I for one plan to go to Mexico where it is legal and done in a compassionate and affordable manner. This will be done if I am ever diagnosed with dementia or Alzheimer’s. To live in fear in a Trump world, a country whose increasingly coarsened politics are normalized means, for me, that 2017 is the new “1984” and Big Brother types will be the Presidents of the future. And the beat goes on! I am 65 years old. Getting ready to draw my first retirement check from Social Security in a couple of months. Something I never thought would even be available by the time I hit this age. Still working though and I hope I can for many more years. I would starve to death if I had to depend on what little I will draw from Social Security to live on. I am one of a few, it seems, who actually enjoy what they do. I grew up in a time when a family having health coverage was a rarity rather than a right. We doctored ourselves. We all lived through it. 4 kids and a share cropper Dad and Mom. We didn\’t run to the doctor or emergency room ever time we had hiccup. If you think I\’m wrong about the hiccup, just go to any emergency room on any Friday or Saturday night and look at the people in there trying to see a doctor for a cold, a runny nose, sneezing, etc. Good heavens folks, its allergy season. Our health care system is falling under the curse of greed, nothing more, nothing less. Greed on both sides of the fence. I was able to, by the grace of God, work my way through college, get a job, work hard and survive to this point in time. 6 kids, 9 grandchildren and a wife. We live as we were taught to live, taking care of ourselves and our own. Helping our neighbors when we can. When we couldn\’t afford it, we did without. We didn\’t go whining to someone about what we didn\’t have. If we needed something or as was more often the case, \”wanted\” something, we worked harder. I have watched a thriving business associated with the workers compensation field almost die because of the business economy in this country drying up. We have hung on by the grace of God. I have watched both political parties squander our money, tax us half to death, regulate us into oblivion, and spend more time worried about their re-election than about the every day man and woman out here struggling to get by. We have been lied to, deceived, cheated, told we are hate mongers because we want to stand up for what we believe in, beat into submission by left wing and right wing idiots who care more about helping those who won\’t help themselves than those who are trying to keep their head above water. We have watched our jobs shipped overseas, our schools stripped of anything resembling education because they can\’t enforce any type of civilized behavior from these young animals they try to teach (ask any teacher who will be truthful with you), our government leaders turn into liars and cheats and we are left with having to choose between the lesser of two evils as to who we vote for. AND if a God fearing, loyal, family oriented, man or woman should dare to try and run for public office they are demonized by the liberal media to the point that they run for cover. Can you blame them? If you are looking for the government to take care of you, good luck! We\’re broke! Have been for a long time! We live in a house of cards. All it is going to take is someone pulling the right card, like our debt, our trade deficit, our weakened military, our lack of anything resembling common sense, our lack of personal pride, our lack of a moral backbone, our lack of a work ethic, well, you get the picture, probably? Maybe not. I am tired of having my money wasted by a government that doesn\’t work. But what can you do? My fear is the scale has tipped so far, the balance cannot be restored. I fear this, not for myself, but for my grandchildren and their children. What a mess we are leaving them. To paraphrase a quote from an \”oldie but goldie\”, our man John Wayne…life is hard, life is harder when you\’re stupid. We ARE a stupid people to have let this go as far as it has. We assumed those we elected to look after us had our best interest at heart. Even when they proved us wrong over and over again, we still gave them the benefit of a doubt. Having said all that, I still believe that at the heart of this country beats the life force of a nation that believes we are better than this. We are a nation that is strong, hard working, God fearing, and anything else you want to throw in. We just need to quit letting others tell us that we\’re not. That somehow, because we have prospered by our hard work, our faith, our love for each other, our helping each other, that we are somehow, LESS than what we are. I believe we are so much MORE. If this government will just get out of our way and let us prove it. Thanks Joe for the chance to put in my 2 cents worth. Have a blessed day!